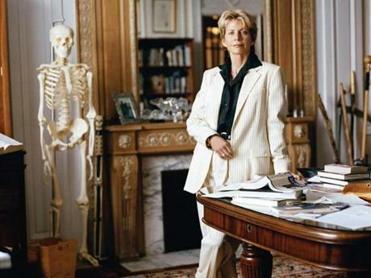 Patricia Cornwell left court Tuesday victorious after a trial that peered deeply into the writer’s personal life. She is sitting in her posh home in the North End with a scenic view of Boston Harbor, and Patricia Cornwell is at once ecstatic and still livid. One of her famed works of crime fiction would not have this much drama. A federal court jury had just awarded her $50.9 million in damages, finding her former financial company cheated her, her wife, and her company out of tens of millions of dollars. A federal judge could increase the award, too. And Cornwell is sitting, one leg crossing the other, just a couple of hours after the decision, lamenting the journey she had to go through in the first place, the type of challenges not even a hero in one of her novels should have to face. “It’s just, we have fought long and hard,” she said, her Southern drawl deepening as she gets more heated while discussing the betrayal of her former finance manager, Evan Snapper, and his company, Anchin, Block & ­Anchin LLP. “It’s just been harrowing, but we felt we needed to do the right thing, we needed to fight,” she said, in an hour-long interview with the Globe. Crime writer Patricia Cornwell is suing her former financial management firm for negligence, in a case that has all the drama and ­intrigue of one of her novels. For the last seven weeks, Boston has had an uncensored view of Cornwell’s life as it has played out at the John Joseph Moakley United States Courthouse, after she sued Snapper and his company for negligence in the handling of her finances. But by Tuesday afternoon the fight — an “autopsy” of her life, as she put it — had been worth it, she said. She had felt it was her responsibility to bring legal action, knowing there are people who would not have the resources to do it if they were in such a position, playing a leadership role as her heroine, Dr. Kay Scarpetta, would have. His company, Anchin, Block & Anchin, released a statement saying that it was also unhappy with the verdict and that it will review its legal options, including whether to appeal. But one juror said that the company should take the jury’s verdict as a call for more ­responsibility. “I think at the end of the day, we came up with a fair decision, and hopefully Anchin will learn something,” said John Martus, the foreman. The case now moves into a technical, legal phase: US District Court Judge George A. O’Toole Jr. will decide whether Anchin violated consumer protection laws, which would allow him to perhaps even triple the jury’s verdict. A hearing is ­expected Thursday. But Cornwell, looking out at the harbor as she reflected on the case Tuesday, said she felt vindicated, regardless of the monetary award. A multi­millionaire, she not only testified in the case but sat there each day of the trial, in the front row, she and her wife Staci ­Gruber bringing their own cushions to help pad the court’s wooden benches as she listened to hours of testimony. She knew that her personal life would be exposed, including the messages she had sent in confidence to others, never believ­ing they would become public. Some of them had criticized friends, former employees. She regrets the messages now, the way she wrote them. She said she had no choice, not after finding the wrongdoing that she and Gruber discovered when reviewing her ­finances, after finding that her worth was far less than she had expected. They never discovered how much money she lost, but ­Cornwell said she made more than $89 million in her four years with Anchin, only to find she was worth little more than what she had when the relationship began. She said she knew something was awry when she was forced to subpoena her own bank records. And she said she remains horrified at the lack of accountability within the company: Checks had been voided, expenses were unaccounted for. One of the biggest stunners, she said, was when they found a $5,000 check that Snapper had written claiming it to be a bat mitzvah gift Cornwell had given to his daughter. “There was a lot of money that went out, and we can find no documentation for it,” she said. Cornwell said she knew the case would be a challenge. Her lawyer, Joan Lukey, had warned that Boston is not Los Angeles: Jurors could have little sympathy for a woman who has helicopters and jets, who makes ­political donations, has a rare book collection, and claims to have lost documents for a ­Ferrari. But “we knew we were telling the truth,” Cornwell said, adding that she earned her money at a time when no one would publish her books. “Yes, I like beautiful cars, beautiful machines. We like nice places,” she said, gesturing to the room around her. “I have never ­denied that. Cornwell knew she was in a fight, she said, after she had filed the lawsuit. First, Snapper offered to federal prosecutors that he had made illegal campaign contributions to high-profile figures such as Hillary Rodham ­Clinton on Cornwell’s behalf. He ultimately pleaded guilty and is serving a probation sentence, though Cornwell was never charged. Still, she said it brought terror on her and her friends who were surprised to find FBI agents at their door. Cornwell said she will look into donating some of what she receives from the award, if she ever gets it, perhaps to benefit mental health research. Gruber is a neuroscientist, and Cornwell has struggled with her own mental illness. Can she write a story like this? “I might try,” she said.